The photo above shows Misurina Lake in Veneto, Italy covered with snow and ice. The light conditions this foggy morning lent an ethereal look to the wintry landscape. 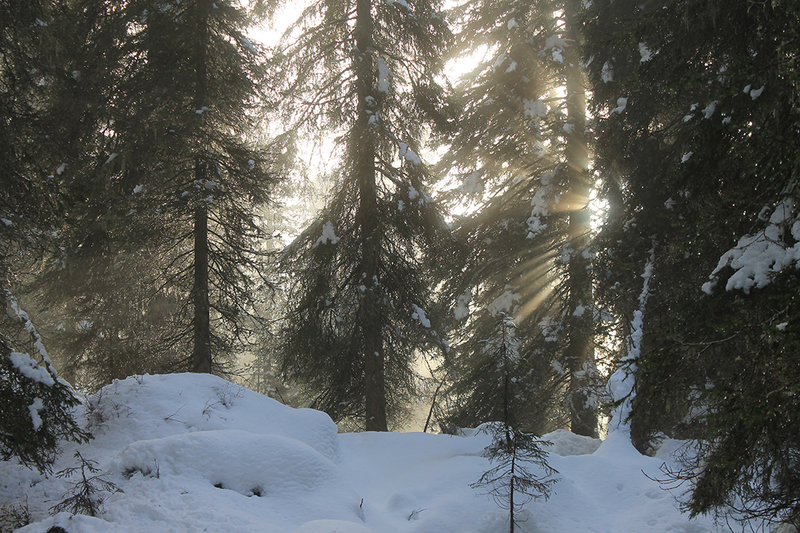 Snow depths in wooded areas ranged from approximately 15-20 in (38-50 cm); the average thickness of the ice on Misurina Lake was perhaps 12 in (30 cm). Actually, when the ice thickness approaches 24 in (60 cm), polo is occasionally played on the frozen surface. Note the incremental contours that show patterns of ice formation and, in some cases, patterns of ice disturbance. Forest trees include, silver fir (Abies alba), Swiss stone pine (Pinus cembra), larch (Larix deciduas), black pine (Pinus nigra), Scots pine (Pinus sylvestris) and Norway spruce (Picea abies). Photo details: Camera Model: Canon EOS 1100D; Lens: EF-S18-55mm f/3.5-5.6 IS II; Focal Length: 35mm; Aperture: f/14.0; Exposure Time: 0.0025 s (1/400); ISO equiv: 100; Software: Adobe Photoshop CS6 (Windows).